Each month guitar picker and Webmaster Bob Howe brings you the latest Country Music happenings on the Internet. You can surf your way from month to month, or why not bookmark the main index for the complete contents! Why not join our mailing list below for notification of each new column? Sadly, much of the early ground-breaking days of television has been lost to us because film stock was often damaged or just discarded due to lack of storage space! Fortunately for future generations, each new format, film to video to DVD etc, sparks a commercial drive to delve into archives for material to re-release. Indeed, the Internet too has brought about a boom of videos from not only stars, but also the average Joe looking for his or her 15 megabytes of fame. YouTube originally started as a personal video sharing service about 18 months ago, and has grown into an entertainment destination with people watching more than 70 million videos on the site daily! If you want to find some great country, bluegrass or roots music, start by typing the name of your favourite artist into their search box and prepare to be enthralled. The quality varies but I guarantee you'll find some gems, but check it out sooner rather than later! Searching for 'country music podcasts' at Google shows an ever increasing array of free shows and interview replays being made available on-demand. A look at the podcast directory inside the free iTunes program reveals gems like an audio version of the recent revealing Troy Cassar-Daley interview from 'Enough Rope with Andrew Denton'. Remember you can download podcasts on your computer if you are on-line and enjoy them anytime, even if you don't have an iPod or even an MP3 player. 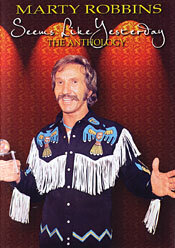 It is wonderful to see some of the legendary country artists being re-released and paid tribute to on DVD. 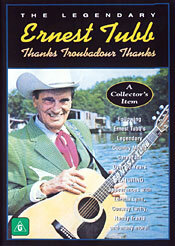 THE LEGENDARY ERNEST TUBB - THANKS TROUBADOR, THANKS is a late-eighties documentary that covers the long and wide-ranging career of Ernest Tubb. Perhaps best known to us for his huge hits Walking The Floor Over You and Waltz Across Texas (to name but two), here we get to hear how he was first influenced by Jimmie Rogers and became a radio star in his own right and then see clips from his movie career and appearances at the Grand Ole Opry. Everyone from Conway Twitty and Loretta Lynn to Randy Travis and Tom T. Hall pay tribute to Tubb in interviews that leave no doubt about how he loomed large over the country music scene. Focusing more on complete musical performances is MARTY ROBBINS - SEEMS LIKE YESTERDAY - THE ANTHOLOGY, an outstanding portrait hosted by Nashville's premier country music journalist Robert K. Oermann. The 19 live songs include virtually every one of his big hits, including El Paso, Devil Woman, A White Sportcoat, and My Woman, My Woman, My Wife. In chronological order we see Robbins master country, pop, Mexican and Hawaiian styles and there is a special bonus feature with great rare footage that showcases five of the 'The Cowboy Songs'. Robbins humour and zest for life shines through the highly recommended release. CARL PERKINS AND FRIENDS - BLUE SUEDE SHOES - A ROCKABILLY SESSION was recorded live in London in 1985 for a television special. 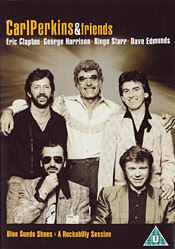 The friends include ex-Beatles George Harrison and Ringo Starr, Eric Clapton, Dave Edmunds, Rosanne Cash and more. The Beatles were heavily influenced by Perkins, Buck Owens and the Everly Brothers in their early days, creating a style that changed the face of popular music as we know it and the admiration of George, Ringo and all the others stars is evident as they give their all alongside Perkins. He himself is in great form; an elder-statesman full of southern bravado but for an emotional moment at the end when he tearfully proclaims his gratitude. Exceptional. Until next time, happy surfing! or request a topic for discussion in future columns, why not E-mail me. John Nutting on Saturday Night Country (your Local ABC Radio and the Web). Would YOU like to be added to our FREE mailing list and be automatically notified each time a new Cowboys in Cyberspace article or competition appears on the Web? Just enter your E-mail address (and/or comments) in the box below and click the button once!